Facebook and the Wright Brothers have a lot in common: their initial flights didn't end too well. "A sudden dart when out about 100 feet from the end of the tracks ended the flight. Time about 12 seconds (not known exactly as watch was not promptly stopped). The lever for throwing off the engine was broken, and the skid under the rudder cracked," Orville Wright wrote of his first flight at Kitty Hawk, N.C.
Facebook's first flight of its gaint drone, called Aquila, that's intended to bring internet access to underdeveloped areas, was hailed as a success by the company, but it now turns out the drone was "substantially damaged" when it experienced a "structural failure" while approaching Yuma, Ariz., during its June 28 test flight, according to the National Transportation Safety Board (NTSB). 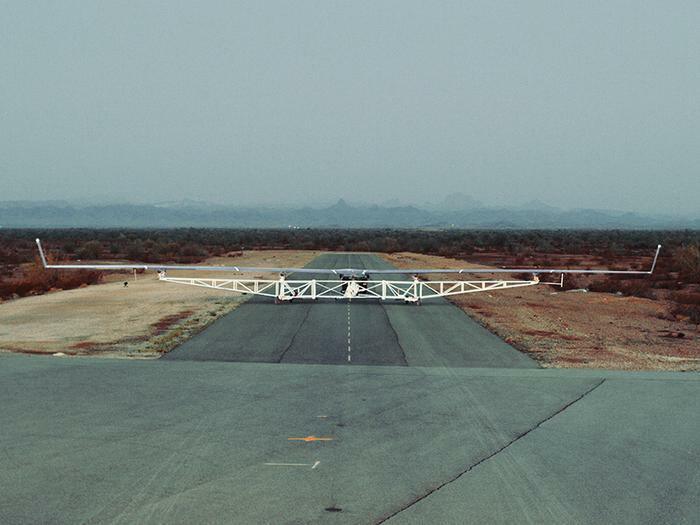 "This first functional check was a low-altitude flight, and it was so successful that we ended up flying Aquila for more than 90 minutes — three times longer than originally planned," Facebook's Jay Parikh said in a blog posting a few days after the flight. "In our next tests, we will fly Aquila faster, higher and longer, eventually taking it above 60,000 feet. Each test will help us learn and move faster toward our goal." But those next tests won't happen until the NTSB finishes its investigation, sometime in the next few months, according to a Wall Street Journal report. It's not the first accident to afflict the ambitious effort. In September, a Facebook satellite was destroyed on its launchpad when a Falcon 9 rocket that was supposed to carry it into space blew up. Facebook insists the project will eventually bring free broadband access to many of the four billion people who now do without it. "New technologies like Aquila have the potential to bring access, voice and opportunity to billions of people around the world, and do so faster and more cost-effectively than has ever been possible before," said Parikh, Facebook's head of engineering and infrastructure. "When complete, Aquila will be able to circle a region up to 60 miles in diameter, beaming connectivity down from an altitude of more than 60,000 feet using laser communications and millimeter wave systems," Parikh wrote. "Aquila is designed to be hyper efficient, so it can fly for up to three months at a time. The aircraft has the wingspan of an airliner, but at cruising speed it will consume only 5,000 watts — the same amount as three hair dryers, or a high-end microwave."